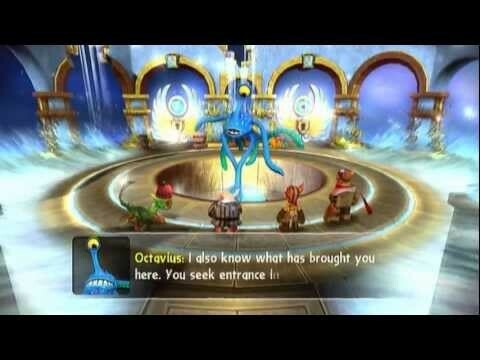 The Oracle is one of my favorite Skylanders levels. I decided to do a branching path level that would ask questions of our players and challenge them in a manner that matched the theme of the question. 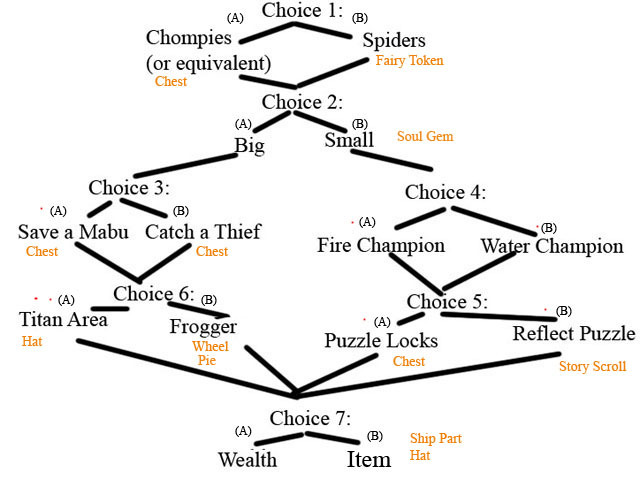 A “map” of the choices possible for QA. They really hated me for this level. The challenge with this specific level was creating a seemingly huge level while reusing the art spaces. I wanted the level to feel complex and require multiple playthroughs to get all of the items. In the end, the fastest way required four full plays to get all the extra items. It allowed me a great deal of freedom to do small quirky one offs of gameplay, like scaling up all the mesh to 300% size and letting the player feel tiny. I was also able to recreate the graveyard chase from Legend of Zelda Ocarina of Time. The Character of Octavius was created by one of our Make a Wish recipients and I was thrilled to be able to work with her in putting her creation in my level.